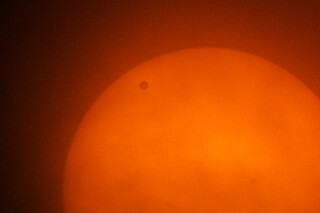 This evening, the last Venus transit for the next 105 years happened (I missed the last one in 2004, not sure when the last one before that was, but suffice to say, they don't happen too often). We got lucky, the weather forecast for Denver was not very favorable for seeing it, and in fact part of the transit was clouded out, but we got lucky in that it cleared up long enough to see both first and second contact, and again at sunset, so we got the best of it (third and fourth contact happened after Sunset for North America, though). At one point we'd considered jumping in the car and just driving east for an hour or two, but the forecast didn't look any better there, and considering how things turned out (and the fact that we were hanging out watching it with a bunch of other locals as a bonus), it's a good thing we didn't. Wow! You got pics! Magnificent! Thanks! Mine were passable, I've seen some really nice ones (especially with H-alpha filters).